I feel very special at being the first one to rate this book a one star....Not really. The quotations were cool The "brilliant observations" were not (they were also not particularly 'brilliant' in my opinion). Too bad, because I really wanted to like this book. I guess I'm the only one who expected more (fun) out of something with that title. And, you know, the part where it claimed to be "easy and fun to read"...It was easy, it wasn't fun. I got bored, I moved on. Either philosophy books aren't for me or I'm really choosing all the bad ones. Douglas Adams'ın mirasını kullanarak promote edilen bu kitap vaadettiklerine ulaşmaktan uzak kalıyor. I'm not a philosopher. For most of my life I've read philosophy because I had to not because I want to. So, when I picked up this book and started reading, it was a revelation to find myself liking it and, even better, wanting to re-read Plato, Aristoteles and all this other thinkers I read by force in high school and in college. Here is a thought book. A book that can be read fast but should be digested with calm and time. Is a well done food for the mind and could generate a series of serious discussions if allowed, or become the not so serious gift that is actually more serious. I specially enjoyed the way the author wrote his own experiences and mixed them with the ideas of philosophers, writers, filmmakers, etc. Classified as ‘Philosophy/Humor’ at the back cover and inspired by Douglas Adams' Hitchhiker's Guide to the Galaxy, this 42-quotation “Deep Thought on Life, the Universe, and Everything” by Mark Vernon would be, I think, delightfully and light-heartedly read by those interested in his ways of looking at what philosophy has to say about life by means of writing a few pages to narrate/argue on each quotation. For instance, No. 34 ‘A person’s character is their fate.’ (Heraclitus) covering about three pages is about John Stuart Mill’s plight and how he coped with it till he found his new character. Intellectual bathroom reading. 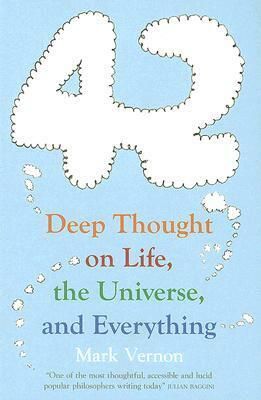 The 42 short essays focus on similar themes -- happiness, friendship, knowledge, and the limits of all. Socratic ignorance is praised. The last essay on passionate agnosticism summarizes his views -- know your limits, never commit to the point of the irrational. A good read that can be read again in any order. It's a series of (most of them) interesting essays about everyday issues. The title is a clever reference to the "big question about life, the Universe and everything". Everyone who has read "The hitchhiker's guide to the galaxy" is familiar with this question as well as the answer to it. Uma ótima introdução a Filosofia. Bem superficial pra quem já entrou em contato com a maioria dos filósofos comentados pelo autor, mas no geral o livro traz boas discussões sobre felicidade, cotidiano, trabalho, amizade, ecologia, espiritualidade e morte. Wonderfully written and deep thoughts indeed. Some topics in more than necessary detail while few are too brief. But overall a very refreshing read and thought provoking indeed. Delightfully accessible read for some one not honed in philosophy. Loved the connections that were made helped knit the text together. I enjoyed this book very much and it helped me with my existential depression.